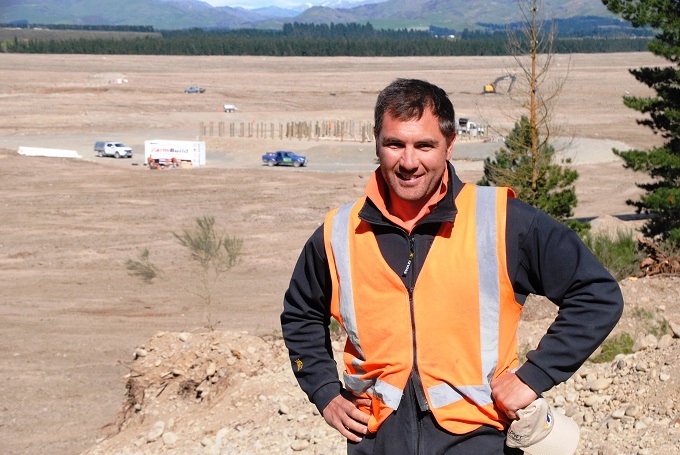 Rhys Narbey, Ngāi Tahu Farming Rural Development Manager, Balmoral takes in an overview of the new Pilot Farm development on cleared forest land. When you drive along the narrow tracks in Balmoral Forest, with dark pines looming overhead, it’s hard to imagine the landscape as productive farmland. Yet the forest landscape is changing and farmland is gradually taking hold. 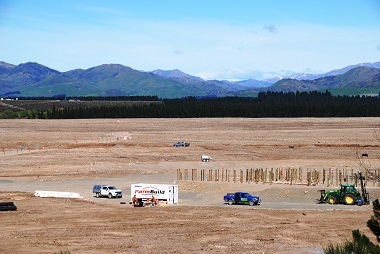 It’s still small scale – just 2,500 hectares of the 9,400 hectare Balmoral Forest has so far been cleared into various states of dryland pasture and in Stage 1 of the development, Ngāi Tahu Farming is in the process of developing an irrigated pilot farm. Ngāi Tahu Farming Rural Development Project Manager Rhys Narbey (Ngāti Kahungunu), says work on the 360 hectare pilot farm began in February 2016. 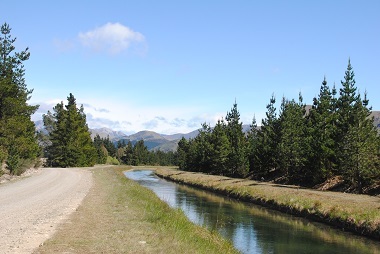 “The pilot farm area was chosen for its proximity to the existing water canal, which is part of the Amuri Irrigation Scheme, which irrigates over 20,000 hectares of land from the Hurunui and Waiau rivers. The land had been sitting in a cut-over state for around five years and its location near the canal made it an ideal spot to start development,” he says. Heavy earthworking equipment was brought in in February to begin removing tree stumps and forest debris, with bulldozers piling rubbish ready for burn-off. That work was completed in June and the development team has since been raking and levelling the land, fencing and grading new farm tracks. Stock water troughs are in place, irrigation piping is now going into the ground and centre pivot irrigators are due for completion in coming weeks. “We’re planning to seed the ground approximately four weeks before we are certain the irrigators are fully functional – which we hope will happen by mid-December,” says Rhys. New cattle yards under construction. “Our aim is to have the first grazing taking place on the farm in late January or early February. Although stony ground has thrown up some challengers, especially for fencers, the pipe-laying team and for pasture preparation machinery, farm development is proceeding at a good pace, with farm shed and stock yards already under construction. Rhys says the remoteness of the location – through a complex tangle of existing forestry tracks, also provides some challenges for delivery vehicles. “We can’t just give them an address because we really don’t have one, so we have to meet delivery vehicles and lead them into the property – then we have to guide them out again so they don’t get lost. It’s very easy to lose your way in here,” he says. Several blocks throughout the forest are in various stages of development. Currently stage 1 will run until 2022. This includes the completion of the pilot the farm and, once water and nutrient allocations are approved, the further development of two blocks, of 1,400 hectares and 1150 hectares respectively, into irrigated farmland. The existing canal, which is part of the Amuri Irrigation Scheme, runs close to the Pilot Farm. Stage 2, from 2023 to 2033, will see the extension of completed water pipelines to enable the development of a further 1,950 hectares of irrigated farmland, as forest trees are harvested. Stage 3, from 2025 to 2033, is planned to convert another 2,300 hectares into irrigated farmland once forest trees have been harvested. “All of the planned centre pivots will have the ability to apply variable rates of water to maximise efficiency and minimise our environmental footprint,” says Rhys. “We expect the majority of the area would be farmed in irrigated pastoral systems like those we run at Te Whenua Hou – mainly focussing on beef finishing but we’re also open to other farming systems.